It was all change in the sub-$300 speaker category this autumn! We removed several popular models which had seen big price drops and, to fill their places, we added some new additions. These included the awesome ADAM Audio F5 and two excellent compact entries – the IK Multimedia iLoud and the Audioengine A2+. Things are getting serious! Alright… not that serious, but as we start looking at dropping up to $300 on a pair of monitoring speakers, we know we have moved past the complete beginner zone. What Can $300 Studio Monitor Speakers Offer Over Cheaper Ones? How Do $300 Monitors Differ Compared to a High-End Set? Regardless of your skill level – whether you are a professional or an enthusiast – finding the right set of studio monitors on a budget can sometimes be a little tricky. A truly impressive monitor with advanced tweeter design and a wide range. Newest iteration of a highly successful platform, now with even better performance . Plenty of power combined with great hardware and advanced reflex port design. Excellent sound for critical listening on the go. A solid little entry from Audioengine with a delightful design. ADAM Audio F5 represent a combination of advanced technologies, high-end engineering, and stylish design. In a market where compact monitors are riddled with compromises, F5 raises the bar to a whole new level. This monitor features the now legendary X-Art tweeter design, which trumps anything your average silk dome unit is capable of delivering. On top of that, we have an extremely tight cabinet, as well as a number of other solutions. The main purpose of ADAM Audio's F5 monitors is to offer near perfect transparency in smaller studios. That is exactly what you can expect from a pair of these. Their response can only be described as clinically accurate. The KRK Rokit monitor speakers series has been regarded as a fool-proof way to get solid performance at a very reasonable price. The latest iteration of this family, the KRK Rokit 5 Gen 3 have taken an already successful platform and added so muchfinesse to it. Performance is great out of the box, but you also get a variety of controls that allow you to trim the sound to fit your needs. What we like the most is the transparency. KRK RP5G3-NA are incredibly flat out of the box, which makes them extremely attractive, to begin with. 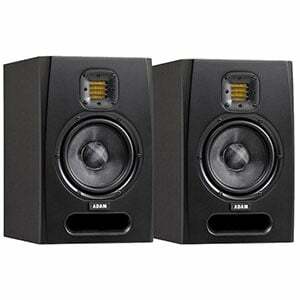 KRK's decision to go with 5" low-frequency drivers was a great one as we absolutely appreciate the extended lower end. Eris series of studio monitors from PreSonus has been one of the most successful and honestly most effective on the market. The second largest set of speakers from this family, Eris E5 has shown us just how convenient budget monitoring can really be. These pack whopping 70 Watts of power and feature great hardware to convert that power to great sound.One way to summarize what PreSonus has achieved with Eris E5 is that they have compensated for whatever flaws this design has by injecting extra power. On top of that, we have the more advanced room acoustic controls, giving us an extremely convenient and versatile set of monitor speakers. One of the most portable studio speakers on this list comes from IK Multimedia – the iLoud. While this minimalist speaker set doesn’t look like much, the build, list of features and overall performance make them a must-have for producers on the go. As we highlight in the complete iLoud review, this highly portable set stand at just over 7” tall, with a 3/4” silk dome tweeter and a 3” high-rigidity custom composite woofer. Other cool features include a quick switch to change between free-field and desktop setup, integrated mic stand thread, and both wired and wireless connections. These award-winning speakers are dubbed ‘the most celebrated desktop speaker of all time’ and we can certainly see where Audioengine are coming from. The feeling with the compact A2+ is one of high-quality, with hand-built construction and hand-polished finishes. At just 6” tall and 4” wide, they are very compact so are perfect for desktops, small setups and travel. The sound is excellent – very clear and plenty of bass for such a small set. While they fall a little short in terms of a flat response for critical listening, the A2+ are still an excellent pair of speakers for a myriad of uses – as we highlight in the full Audioengine A2+ review. The first and probably most important improvement is transparency. When you enter the sub-$300 price range, you will find that manufacturers try their best to make their monitors as flat as possible. As any producer knows, transparency is key to delivering an accurate piece of quality audio. This is why these are monitoring speakers, not general consumer speakers. Cheap monitors deliberately don’t aim for this transparency, because the majority of users interested in a cheap set of monitors will usually want to use them for general purpose music listening as well. Therefore, a good portion of models found in the sub-$100 range will have a significant bias, often in the lower end. Naturally, $200 should get you a set of speakers with more transparency, but it’s only as we enter the $300 range that things become flat enough for pro-level mixing. It’s usually easy to tell the difference between $300 monitors and a lower-priced set by looking at the build and components on offer. The overall build is going to be more robust, while the aesthetics are sometimes more interesting and stylish. Spending around $300 will usually see you end up with a stylish pair of speakers that will look cool in most studio setups. In terms of transducers, cheaper monitors come with low-frequency drivers that are up to 5” in diameter. However, many of the low-frequency drivers in today’s category are anywhere from 5” to 8” (unless you opt for a travel or compact model), while tweeters remain at around 1”. Another area where you will find tangible differences is connectivity. Many budget speaker sets will feature RCA ports and maybe some 1/4” TRS ports. An average $300 set of studio monitors will retain these, while expanding that selection to include XLR connections, while some come with USB ports and Bluetooth connectivity for ultimate convenience. Are you planning to just open the box and dump your speakers onto the nearest table? Good luck getting the best out of them! To ensure that you achieve the best sound quality and accuracy from your speakers, it is worth considering where in the room you position them. We always say that the main thing to remember when it comes to speaker positioning is that symmetry is key. Ensure the two speakers and yourself form an equidistant triangle. By this, we mean that the first speaker should be the same distance between both the second speaker and your head. Talking about your head, another important positioning tip is to keep the speakers at a level that is in line with your head (preferably your ears), so that the high-frequency tweeters are shooting straight towards you. Finally, ensure that the speakers are not stuffed into a corner. This is because sound reflects off everything in the room to some extent and, if your speakers are placed too close (around 50cm or less) to a rear wall, then the sound will reflect off the wall and become a bit muddy due to the artificially enhanced bass and mid-range. To summarize – have your speakers at ear height, at an equal distance away from yourself and each other, and not too close to a corner! We have discussed the difference between a $300 set of monitor speakers – like the models on our list – and their cheaper counterparts. So how do $300 speakers compare to more expensive studio monitors? At first glance, there isn’t much difference in the size of the transducers, with anything from 5” to 8” still the norm in the low-frequency drivers. However, the quality of these drivers significantly improves as you add more money to the mix. This means that you won’t run into distortion when you begin pushing the speakers to their limits. High-end speakers will also be incredibly flat compared to sub-$300 speakers, where some low to high oscillations still occur. Of course, we also have the build quality and overall design of the cabinets. The quality of the MDF used, the way it is crafted and the design of the ports will all have an impact on the sound you get and the higher-end studio monitors have these areas perfected. While a $300 set of speakers aren’t going to the best monitors on the market, they offer a serious step up in quality and performance compared to budget speakers. The speakers we have shown you above are definitely among some of the best you can get at this price range, and will be of interest to keen audio producers of all levels. Of course, be sure to read reviews, watch videos and – if possible – listen to your shortlist of speakers in action before you make your final decision!